We just announced the availability of a new option for Azure Media Services called, “Premium Encoding”. It now enables complex workflows & tuning for transcoding media into different formats using some automation that can dynamically adapt to the content. Among other things, it also provides users with the ability to output their content in 4x the number of formats using a large number of audio & video codecs. It also provides the ability to ingest 2x the number of audio/video formats. Video encoding can be a complex and complicated space. I often get requests from customers asking for ways to transcode formats that are used primarily in broadcast studios, or in the movie industry. Accompanying these formats are also complicated ‘recipes’ to process the videos that requires custom logic to make decisions about what encoding steps are required. This week, I am excited to introduce a new technology in Microsoft Azure Media Services that allows our more experienced customers to solve such workflow problems. This premium encoder offers superior quality and flexibility suited for broadcast industry/professional media transcodes. This includes automated decision-making logic that can adapt to a variety of input and output file formats such as MXF, support for additional input and output codecs such as DNxHD, support for higher output resolutions – up to 4K in AVC, support for closed captions, and much more. 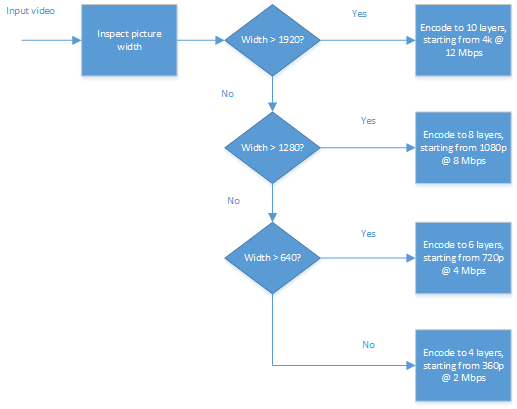 In this blog, I will provide you an overview of the new capabilities of the premium encoder. Please click here to find out more about pricing and visit our documentation center to learn more details about how to use this encoder.